1. I bought this polish on a whim as I've never been much for pink. 2. 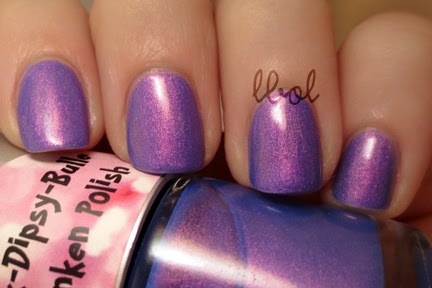 It's seriously one of my favorite polishes of all time. I don't know how meaningful this is as my polish addiction is only a little over one year old. BUT OF ALL TIME THOUGH. 3. I lost my first bottle. I tore up my whole house looking for it. I'm pretty sure my toddler stashed it somewhere (like the trash can) and I mourned for like, three whole days. 4. I practically begged for somebody to sell me theirs as it's no longer being made, and somebody did!! So, I don't know what it is about this polish, but I love it so much. The color is so good, you know? 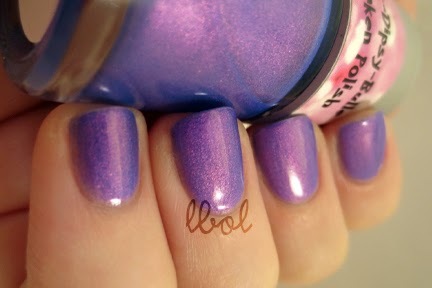 It's a blue base that looks periwinkle mostly because of the strong pink shimmer, and it's nice and opaque in 3 thin coats that dry amazingly fast. It does dry just a touch matte so it's shown here with (say it with me!) one coat of Essie G2G in artificial light. It's just radiant, you know? I don't even know a less dorky way of describing it. Radiant. I always (not always always, I guess) read reviews about polishes that "practically apply themselves" and that got me wondering what that kind of polish felt like. This is the polish that explained it to me. It's like, it knows that it's supposed to be all over those nails and it wants it. If it was a color PinkDipsyBulle still produced I would enthusiastically urge you to get it, but it's not, so you can just stare at my fat-looking fingers and pretend they're yours and get kind of sad about missing out. I just bought two more bottles from her today, and I cannot wait for them to arrive.